There are many who believe that the jungle has medicine for the whole world. Whether it is the immense wealth of medicinal plants, its powerful ability to sequester carbon from our atmosphere, its biodiversity of plants and animals, or a spiritual destination where travelers reconnect with the divine in nature, the Amazon is a global treasure filled with inspiration. This wisdom is conveyed in explosive color with sublime representations of real and other-worldly creatures in the artwork of Luis Tamani. This January and February Australians will have a rare opportunity to see him paint live and witness the visions that emerge while he travels a continent far from his home in the Amazonian jungle of Peru. 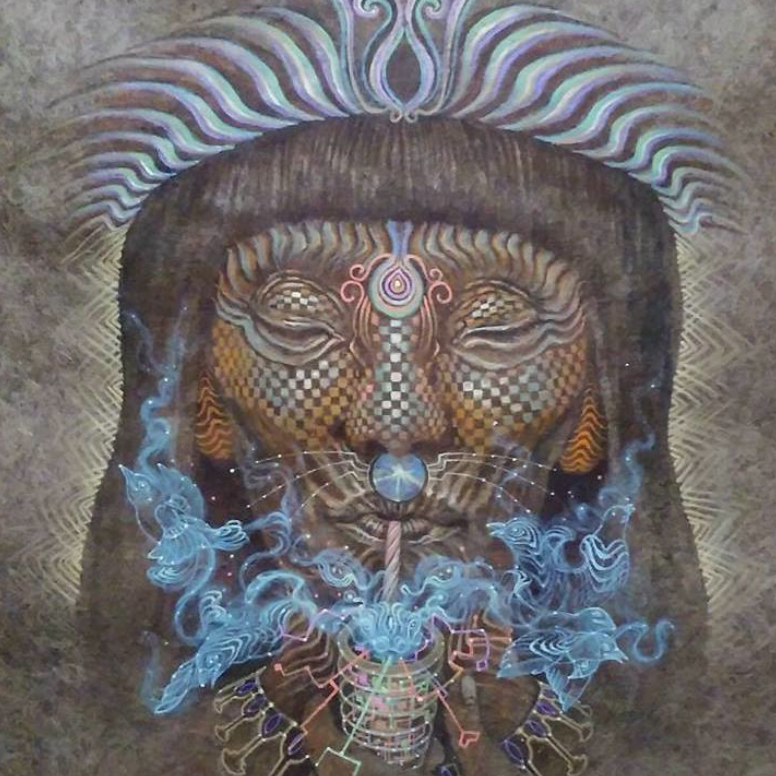 They say a picture is worth a thousand words, likewise Luis’s paintings are like an encyclopedia of mystical wisdom. Incorporating plants, spiritual deities, and swirling energies in a rich, lush jungle-scape full of waterfalls, colorful birds, and elders in ceremony allows the viewer to step into another world. Tamani is a messenger for something ancient that is reawakening, something indigenous that is contemporary yet eternal and he conveys it through brush strokes on canvas. In addition to his formal training, Luis is influenced by the sacred ceremonies and medicinal plants of the jungle. By merging his own visions with art, he is able to show the interconnectedness between humans, plants, and animals. He also brings reverence to the deep cultural traditions that have been preserved in the shamanic traditions of the region. 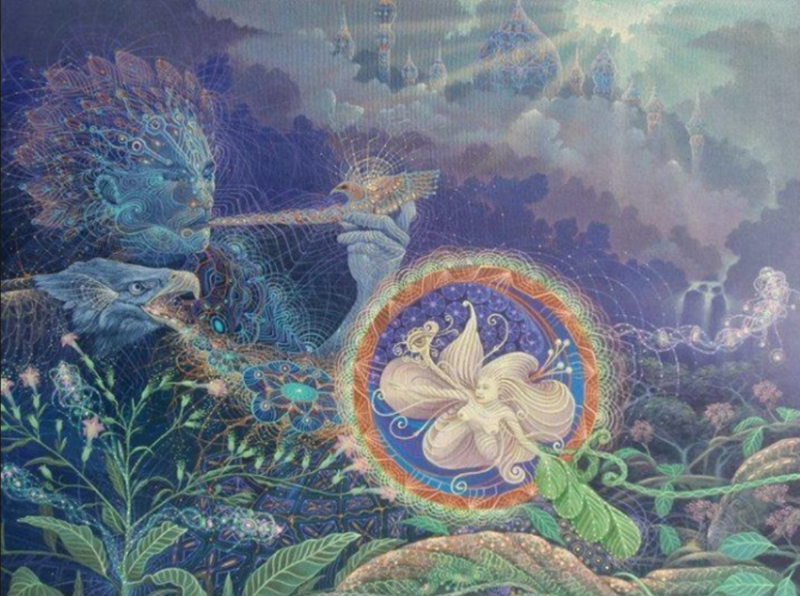 Artists can be mediums through which visual transmissions of non-verbal information are conveyed from the plant kingdom or maybe even from other realms altogether. Humans have always used art in all forms to convey ideas that transcend words. 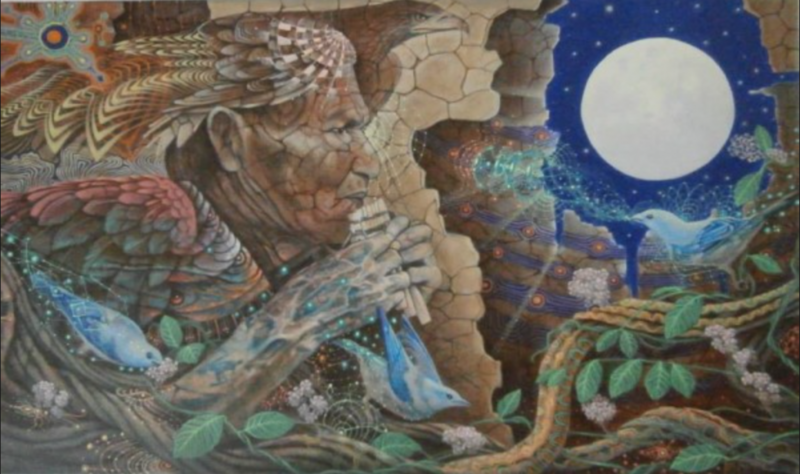 Luis is in the category of artists who play a shamanic role in modern society, awakening us all to the divine by invoking wonder. If we want to take this concept of mirror neurons to the next level, imagine what is happening in your brain when you watch the artist create live right in front of you? Luckily if you live in Australia, you can experience it for yourself when Luis visits your region. Exhibition, Live Painting and Workshops at Rainbow Serpent Festival, and Somara Festival.